Based on a document I have from the Ministry of Public Administration and Security, "TAEGEUKGI - Korean National Flag" (2008, Korean Language), I am able to clarify the design of the South Korean flag when it is flown vertically. Many times, these are use for light poles for national celebrations or state visits. If the flag is being flown on the viewer's right of the lightpole or post, the trigram "geon" (kun on our page) must be at the top right with the red portion of the disc facing to the right. Conversely, when the national flag is on the left side of the pole, the "geon/kun" must be at the top left and the red portion must face the left. 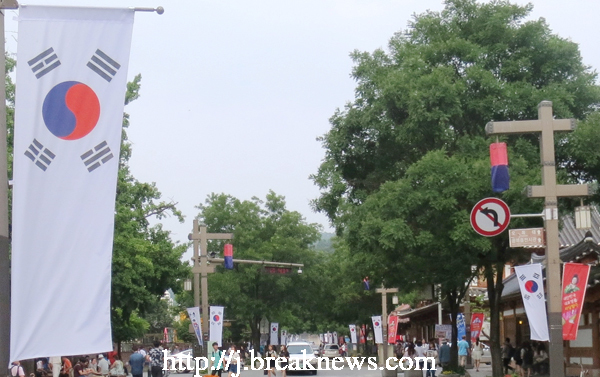 When another flag is displayed on the light pole with the South Korean flag, the South Korean flag takes the left side and the other flag takes the right side. As for my main issue from before, the overall size of the flag, the laws listed above have been clarified for me (looking at the legislation and also from looking at actual flags in the field. The base design and the ratio of the flag, which is 2x3, must not be altered; however, after the main flag pattern is left alone, any additional white fabric can be added below the flag and can be any size desired. The law illustration provides for 1.5 of the flag's length but I seen photos where it can be even longer than twice the flag.